Last night was the mid-season finale of the final season of AMC’s Mad Men. The show, like the final season of Breaking Bad, is being split into two parts, with the first part having just aired this year, and the final 8 episodes will air next spring. I can’t say that before the season starting, I was weeping over the fact that the show was at its end. Ever since the beginning of Season 5, the show was in decline, for my taste at least. It’s not that the show lacked in visual style or its writing and acting by its incredible cast. I think the problem was that it was just starting to put on the brakes a bit. Some sub-plots felt pretty meaningless, and there were just some unnecessary moments in Season’s 5 and 6. Luckily, the Season 6 finale ended on a very high note, with it having Don Draper with almost nothing. He was on leave from the company after exposing his past to everyone during a very important meeting with some clients, and we see him in the season as a man with damn near nothing to live for. His wife, Meagan, was on the other side of the country, he never really saw his children (except for a very stellar episode involving him and Sally), and he was out of a job. And for this reason, it’s the best season of Mad Men in years, because the show at its core, was always a character study of several of these characters, but most prominently of Don Draper. Jon Hamm has played this role so flawlessly for 7 seasons of television, and even when the show was really lacking and getting pretty slow, he was always the part of an episode that you looked forward to seeing. He had such presence when he was on-screen, and it’s easily one of the greatest performances that has ever graced television, easily in the same ballpark as Bryan Cranston and James Gandolfini. We, as the viewers, had always expressed empathy for the man whose past is still very mysterious to everyone watching and everyone in the show, and this season, Draper was at his most empathetic. That down on his luck aspect of this season was easily the strongest part of this new season, and it’s even more satisfying when Draper returns to work, and he can’t be the womanizing heavy drinker that he had gotten away with so easily years ago. He’s being watched by all of the partners, which are his boss now after his little stunt last season. And a lot of this great writing comes from the exceptional writing by Matthew Weiner, who is one of the great showrunners to ever grace television. One of the reasons that I still have a draw to Mad Men is because Weiner came from HBO’s The Sopranos, and if you watched that program, you’d know that the show specialized in a brilliant character study of Tony Soprano, along with the rest of that amazing cast. What that show also did was have these episodes that really stood out from the bunch, where they would take some serious creative risks in episodes that didn’t really advance the plot in what happened last week, but showed the mental state of Tony Soprano (the episode with Annette Benning is a great example). Weiner does the same with this show, and while this season was lacking in an episode that was really, really out there, I don’t think it would have worked in this final season, as there is too much at stake, and there is very little time left for Weiner and his writing staff to wrap up Mad Men. Before I sign off for the day, I want to mention something that I have really enjoyed this season, and it’s that the show has finally nailed telling this story exceptionally well as well as showing off this incredibly interesting time period of 1969. The period piece aspect has always been one of if not the strongest aspect of this show, but when the show progressed into the mid-60’s, that’s when the show started to lack in quality, for me at least. 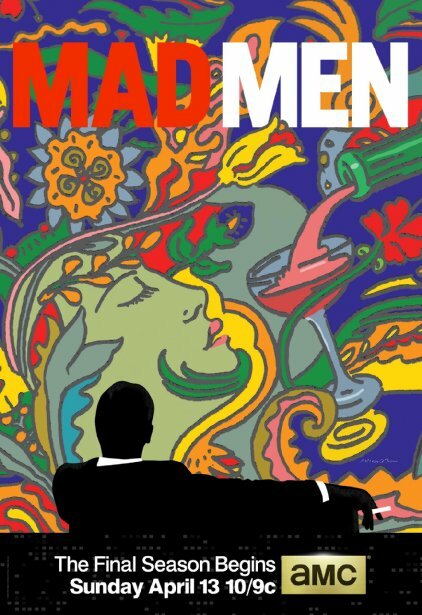 That was a big turn off for me in those past seasons, because with that later time period, Mad Men could have done some really creative things with the period, and it’s not to say that they did, but it wasn’t like the first four seasons. This season, they nail everything. The period, the writing, the acting, it’s all exceptional. Another thing I have noticed throughout the past few seasons in the mid-to-late 60’s, is that everybody seems to be changing in appearance and in style, with characters growing their hair out or wearing thicker ties, and forgetting about the glamorous and nostalgic early 60’s. What I’ve noticed in the past three seasons, and every season, is that Draper continues to look the same. He still wears the skinny tie, he still graces the short, no side-burns haircut, and so on. Granted, there are folks that are more qualified to explain that character trait better than I can, but I always thought it was an interesting trait, Draper’s nostalgia for a better time than what’s happening to him at the moment. So, we have to wait another year before we see the final 7 episodes of Mad Men, and it’s nothing to be rushed. It’s not like the season ended on a cliffhanger with a character sitting on the toilet finding out about Draper’s past (only Breaking Bad fans will get that reference), it ends more subtly, and I’m guessing that these last couple of episodes will be polarizing and provocative, to say the least. I don’t think everybody will be satisfied with how the show will end, but none of us know at this point, so now it’s up to speculation. Let’s just hope it’s better than The Sopranos finale. May 26, 2014 in Television Reviews.